Ballet Arizona company dancers in class. A dancer’s relationship with their shoes is an important one. In most cases your teacher will recommend a specific brand such as Freed, Grishko, or Bloch, but make sure you take the time to find the right fit for your feet, just remember this might take some trial and error. After that comes breaking in the pointe shoes and luckily for you we have a video to help! Most important thing to remember is to continue strengthening your feet – that means lots of tendus and relevés! When en pointe for the first time, you’ll be using different muscles in your body. Some dancers may experience new technique overload, attempting to think about each step with meticulous focus. It’s not uncommon to forget about the basics, like using your core. Try doing a small ab workout before your class to fire up your core muscles and remind your body to use them. We all know warming up your body before a class can help prevent injury and sore muscles the next day. Stretch-out your body before your technique and pointe classes. Then, after your class, stretch again to ensure you’re caring for the new muscles you’re using – your body will thank you! It’s also a nice way to wind down mentally and process what you’ve learned. 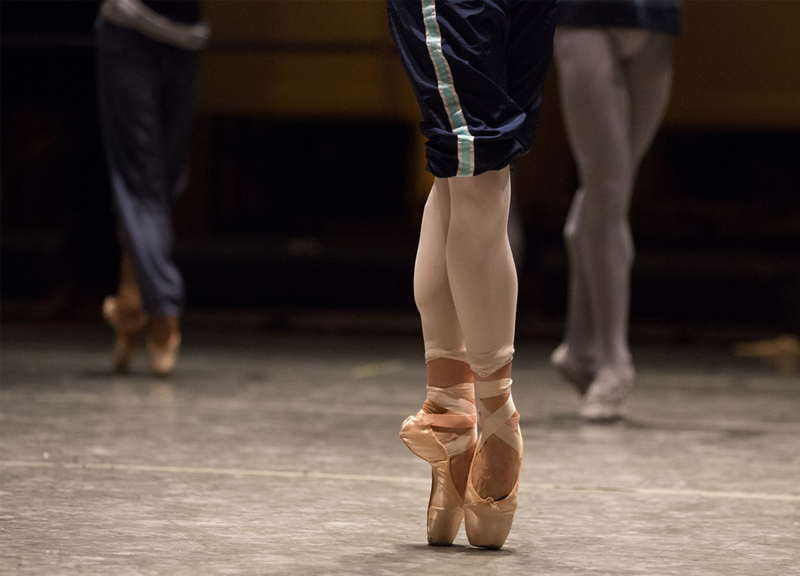 Just like stretching, doing foot and toe exercises are going to help build your strength and improve your pointe work! As we said earlier this means lots of tendus and relevés – going between demi and full pointe. Also consider getting a Thera band which will provide some resistance and help strengthen both your arches and toes as you go between pointing and flexing the feet. Another great muscle-builder for the toes is to do toe crunches or try picking up a small object with your toes! This is the most important tip there is – start with the basics. You probably have a bunch of ballet dancers you admire and aspire to be like but before you can take on the iconic 32 fouettés in Swan Lake, you have to build a steady foundation. Just like starting out in technique class, you need to build your strength and master the basics before anything else. So, take your time and when you’re ready, you’ll notice your progression moves that much quicker.